I’ve realized I didn’t really plan anything for Christmas. Woops. The purpose of the pink piece is portrayed! Sorry I felt like alliterating. At least Pivot may have another new friend to “talk” to, but I hope she remembers that ignorance killed the kitty, and curiosity was framed. I recognized HEX on a first glance and got extremely curious what it reads. So I’ve OCRed it and then translated into ASCII and… hah. I really love such “bonus” things put in plan sight that most of people will probably miss. Poor PV, I wish I could give her a hug. 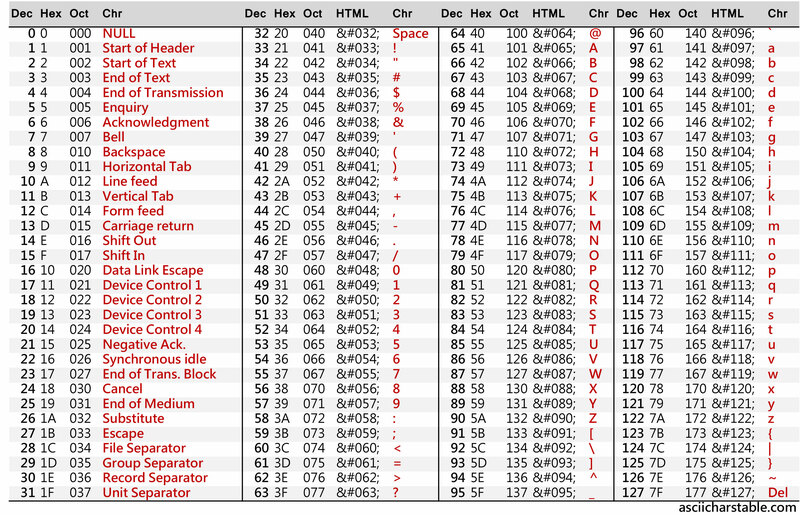 It’s a Hexadecimal code. To put it simply, it’s numbers in “base 16” instead of the usual 1-2-3-4-5-6-7-8-9-10 “base 10” system, it’s 1-2-3-4-5-6-7-8-9-a-b-c-d-e-f-10. As such, we can understand that (54 68 65 72 6d 61 6c) to mean (84 104 101 114 109 97 108). Now, converting these numbers into ASCII, or American Standard Code for Information Interchange, we get a series of symbols, each corresponding to one “Number” in Hexadecimal. So, in without further ado, lets convert these numbers using this handy table. (Well, in reality I’m using HxD, which autoconverts them when I typed them in, but you get the idea). 54=84=T 68=104=h 65=101=e, and so forth. It seems as if the AMP was interupted….implying it has a personality? It’s talking? My apologies Redoneter593. I’ve got really excited to have learned the bonus thing and… it didn’t feel right to just bluntly post the hidden thing right away. Not that I blame you SKW for doing just that, truth to be told, I was seriously tempted to do it as well. Instead I just wanted to… spark curiosity of other readers. I wanted to trick you people into doing a little bit of research and trying to EARN the bonus thing all by yourself. I wanted you to feel the same glee out of your finding I did feel. You know, that “Yes! I’ve made it!” kind of feeling. Still, for all the restless, putting the actual secret up front, might be good enough. I just wish this comment section had tags. I was saying that I just wish this comment section had “spoiler” tags. You didn’t need to trick me into trying, I kind of wanted to give my brain a bit of a workout anyway. I bet the Symmetric Projector makes holographic decoys when it’s functional. C’mon, where is she going to get the dough for half of that stuff she can’t even identify? 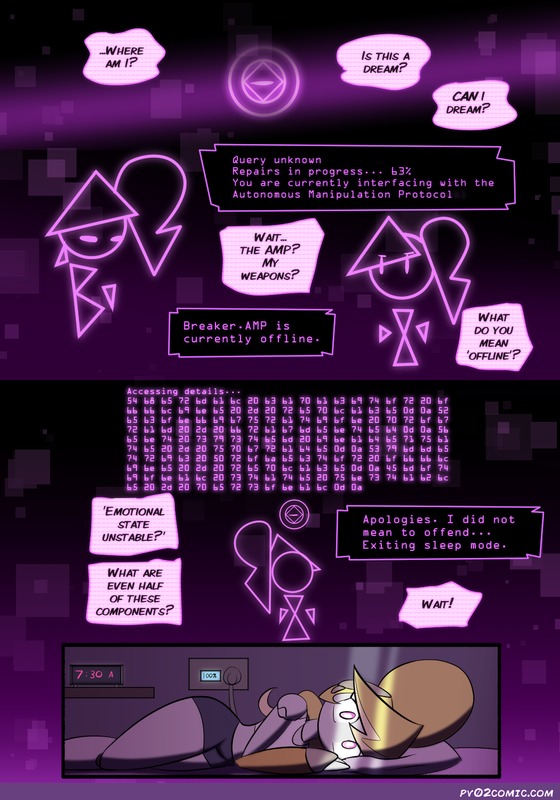 (did the ascii thing too, as per Stone’s post) Awwh, she looks stressed and sleepless. “Poor” piv, indeed. This doesn’t really relay to the page, but I must wonder if the cute li’l spider girl Cesil may show up sooner or later, maybe as a librarian or something. I’m afraid Cesil is in a different timeline. Seriously, no meme intended.